The northern Syrian settlement of Ugarit had been inhabited since at least the Neolithic age (6000 BC), while by 15th century BC, it had turned into a strategic port city that had trade connections with the Hittite Empire, the Egyptian Empire and even distant Cyprus. Given such extensive trade networks the city-state reached its zenith in the epoch between 1450 BC – 1200 BC; and its rise to glory could be surmised from varied archaeological remains that ranged from a grand palace, temples to even libraries (containing clay tablets) that were unique in such a period of history. But beyond relics of past, archaeologists (in the 1950’s) were also able to discover something that had present-day context. We are talking about what turned out to be the oldest known piece of music ever found in the history of mankind – and it pertains to a 3,400 year-old hymn composed of cuneiform signs in the Hurrian language. The musical compilation (found in the form of a musical notation system etched on clay tablets) is better known as the Hurrian Songs. These were probably played on contemporary lyres, while the most ‘complete’ of this musical series pertains to the Hurrian Song to Nikkal. Nikkal was a goddess entity of Ugarit/Canaan (and later of Phoenicia), and she was worshiped as the safe-keeper of orchards and gardens. Interestingly enough, experts have been able to recreate the melody of the Hurrian Song to Nikkal. 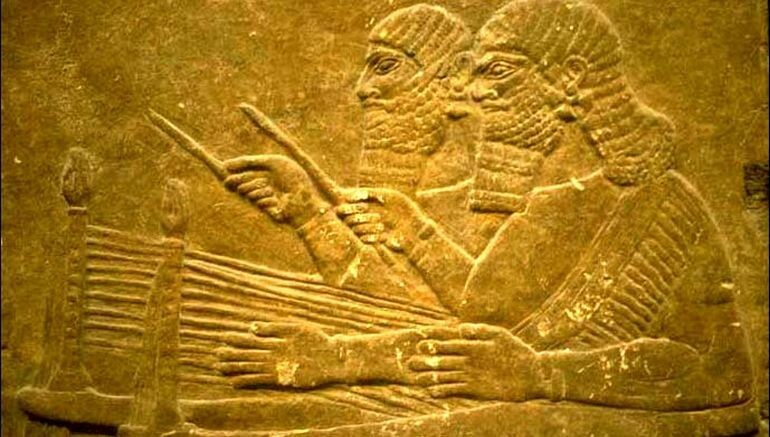 The midi keyboard version below offers a modern take on this ancient composition (oldest song), based on the interpretation produced by Anne Draffkorn Kilmer, professor of Assyriology at the University of California, back in 1972. Now if the midi keyboard version doesn’t conform to your musical sensibility, scholars (including Anne Draffkorn Kilmer and Richard Crocker) have produced variants of the Hurrian Songs in lyre – a musical instrument that was probably more contemporary to Ugarit inhabitants. Musician Michael Levy has also produced his lyre interpretation for the A Hurrian Cult Song from Ancient Ugarit, and the soulful version can be heard from the video below.